Summary Two-bay dual-core Marvell NAS with wide range of downloadable apps. Summary Four-bay dual-core Marvell NAS with wide range of downloadable apps. 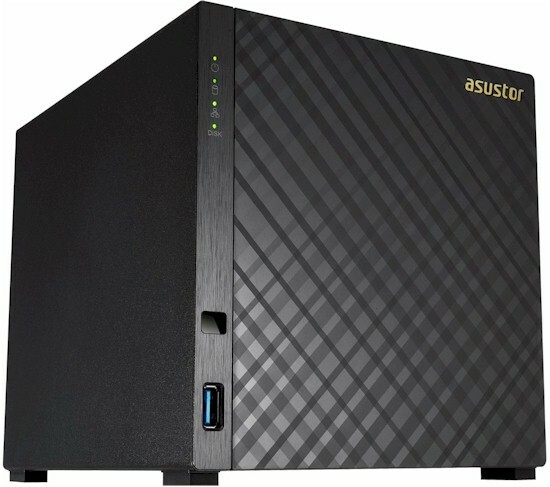 ASUSTOR has been refreshing its NAS lines and we've reviewed most of them. This review covers two new models in its "Personal to Home" family, the AS1002T two-bay and AS1004T four-bay NASes. The chart below generated on the ASUSTOR website shows key differences in this family. 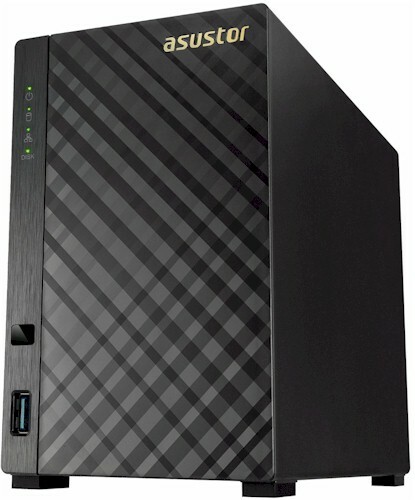 First, the AS100xT models are powered by Marvell Armada processors; the AS-20xT models are powered by Intel Atoms. Both processors are dual core. The AS100xT NASes also have less memory (512MB non expandable vs. 1GB), fewer USB ports and lack the HDMI and audio output ports found on the AX-20xTE NASes. However, the AS100xT NASes have a hardware encryption engine that's missing on the AS-20xTE NASes. The AS100xT NASes, along with the new AS310xT NASes feature a new look. Rather than having the disks exposed, each of the NASes has a diamond-plate embossed solid front panel. Aside from looks, this means these models do not have hot-swappable drives. There is a new Quick Installation Guide common to both AS100xT NASes. There wasn't a complete front panel view available in the quick start guide, but the LED callouts below show what you really need to know. From the product shots at the top of the page you can see that there's a single USB 3.0 port on the front panel. Unfortunately, with the new case design, you can't see activity indicators for the individual drives as you can on other ASUSTOR models. There's a single LED indicator to show disk activity. The image below shows the rear panel callouts. There's a single USB 3.0 port and a single Gigabit Ethernet port. The image below shows the AS1004T which, like other ASUSTOR four-bay NASes, uses a 120mm fan. The AS1002T, like other ASUSTOR two-bay NASes, uses a 70mm fan. Like many ASUSTOR NASes, our AS1004T test unit was very easy to disassemble. As the quick start guide shows, you can easily disassemble the case without tools. The image below shows the inside looking at the front with the case removed. You can see the four eSATA connectors on the drive backplane. The image below shows the main board with the heatsink in place covering the processor. The rear panel connectors are on the left side of the image. For comparison in this review, we'll be using the ASUSTOR AS-202TE and AS-204TE. In addition, for the two-bay comparison, we'll be using the recently reviewed Western Digital My Cloud Gen 2. Four our four-bay comparison, we'll be comparing the two ASUSTOR NASes with the Western Digital My Cloud Expert Series EX4100. The table below shows the key component summary for the products being used in our comparisons. With two drives, the NAS drew 14 W with WD Red 1 TB (WD10EFRX) drives spun up and 8 W with the drives spun down for power save. With four drives loaded, the power draw was 20 W active and 10 W in power-save. Noise was rated as low. RAID 10 rebuild time was 3 hours and 7 minutes for a 4 X 1 TB configuration.